The 2nd edition of Ultra-Trail Panoramic from Maehongson to Pai in the Northwest of Thailand was again the final 100 miler in the Asia Trail Master Championship. While participant numbers were still on the low side in 2016, this year the event attracted many hundreds of runners including some of the best ultra trail runners in Asia. And yes, the winner - Steven Ong - crowned himself the new champion in the process! Steven did not have the best memory of his last visit to Thailand, when he had jelly legs that eventually even resulted in a DNF at Ultra-Trail Chiang Rai last October. As such, Ong made his life chasing the Asia Trail Master title much more difficult. The 40-year-old Malaysian was the hot pick for the championship after the first semester, and especially after his commanding victory at Tam Dao Mountain Trail in Vietnam. He looked to have everything under control when he traveled to Europe during the summer. But then came Chiang Rai and the zero points, when his main rivals such as Arief Wismoyono, Sefli Ahar and Manolito Divina were collecting top points everywhere in Asia. But then came Chiang Rai and the zero points, when his main rivals such as Arief Wismoyono, Sefli Ahar and Manolito Divina were collecting large doses of points everywhere in Asia. Suddenly, it was make-or-break for Steven Ong and it all had to happen in one race: Ultra-Trail Panoramic. On paper the task was huge. Ong was facing tough competition from 2016 ATM Champion Manolito Divina, who beat him in April at the fast Sungai Menyala 50k, Italy's Alessandro Sherpa, Japan's Wataru Iino and last but not least Thailand's own Sanya Khancai. A lot of good trail runners who could steal necessary points away from Ong. As the race unfolded, Ong again adopted a sit-back and see-what-happens approach, which is becoming his trademark. After 100 km he was ranked alongside Khancai in third place, but nearly an hour down on Wataru Iino, and also Sherpa was running ahead of him. Manolito Divina, unfortunately, had already dropped out by then. AT CP2 he was visibly unwell with severe stomach issues, which ended his ATM season on a sad note. As mobile connectivity is limited in the forest area near Pai, everyone was expecting a Japanese race victory at the finish line. Until all of a sudden, reports from the field announced the imminent arrival of Steven Ong into the finish as leader of the race! The new Asia Trail Master champion ran a very strong final section to pass both Iino and Sherpa and grab his fourth race victory of the ATM season. In fact, also Sanya Khancai still overtook the early leaders to take second place on the podium. Iino salvaged third. In the women's race, the new Asia Trail Master champion Kim Matthews pulled out rather quickly due to stomach cramps as well. Matthews, who was certain of the ATM title following the DNS of Tahira Najmunisaa, had started her first ever 100 miles, but it wasn't to be on this occasion. Her role, however, was taken over in splendid style by another Australian runner: Joanna Kruk. Kruk, from Polish descent, raised eyebrows last October by winning Ultra Trail Chiang Rai with a formidable pace. And did she do it again! Always running right behind the top four men, she even managed to catch Alessandro Sherpa still going into the finish. Joanna Kruk lives in Australia and has been flying over for the races. If she does that five times in 2018, we have another championship contender! With three races this year, she still manages to score 1575 points and 7th place in the championship, ahead of Sandi Menchi who also 3 races in the books. Joining her on the podium of the 100 miles race were Hong Kong's Shuk Kuen and South Korea's Been Lee. Joseph Sibal is a popular new Asia Trail Grandmaster after finishing the 100k race! 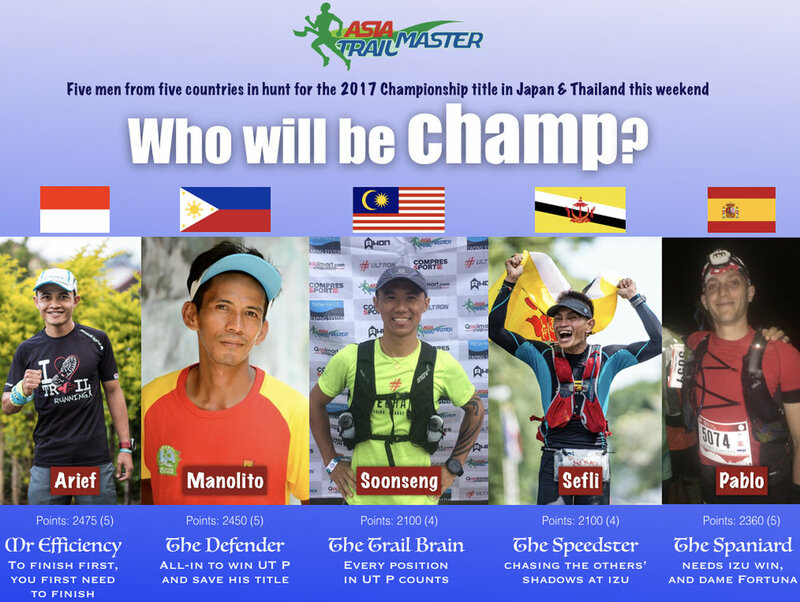 It’s the last weekend of the 2017 Asia Trail Master Championship and it is going to be a thriller. Two races, Ultra Trail Panoramic in Northwestern Thailand and Izu Trail Journey in Japan, determine the outcome of an exciting points championship that still has five runners in contention for the men’s title. While Vietnam-based Australian Kim Matthews is already assured of the women’s Asia Trail Master title, Arief Wismoyono (Indonesia), Manolito Divina (Philippines), Steven Soonseng Ong (Malaysia), Sefli Ahar (Brunei) or Pablo Diago Gonzales (Spain/Singapore) will be crowned the men’s champ on Sunday afternoon. All five will be in action in either Thailand or Japan, except Arief Wismoyono, who leads the ranking at present with 2475 points. The Bandung Explorer Ace has suffered from shin splinters following BTS Ultra last month is not recovered enough to compete in ultra this weekend. A pity for the 34-year-old, who this year returned to his best level and will just have to wait and see what the others do. Last year’s ATM champion Manolito Divina is only 25 points down on Wismoyono. He already has five results in the bag this year, which means he needs to do better in UT Panoramic than his “worst” result, i.e. 450 points at Vietnam Mountain Marathon or UT Mapawa. Divina needs to be first (525 points) or second (475 points) in the 100 miles race of UT Panoramic to achieve that and hop ahead of Wismoyono (Divina beat Wismoyono in a straight dual at Sungai Menyala Forest Trail in April, so in case of equal points he gets the advantage). However, it is Steven Ong and Sefli Ahar who hold the key to the championship. The Malaysian and the Bruneian so far only scored four results (both also had a DNF this season), which means they can still get a full whack of either 525 points (Steven at UT Panoramic) or 550 (Sefli at Izu Trail, the Japan SuperTrail), as for the championship it is the best five that count! The beauty is that now they both have 2100. They are 375 points behind Wismoyono, and need 425 in case Manolito wins in Thailand… That means minimum 3rd place for Steven (on equal points Manolito wins as he beat Steven in a straight dual), minimum fifth place for Sefli. So, there’s a lot of scenarios possible. One thing is for sure: If Steven wins UT Panoramic, Sefli needs to win Izu. And if somehow we get a really crazy weekend in which Sefli, Steven and Manolito all DNF and Pablo Diago Gonzales delivers an outstanding run to win Izu, it will be the Spaniard who takes home the 2017 Asia Trail Master title. Unlikely but as we always say: ‘in ultra everything is possible’. Of course, there are more top runners at the start in both races this weekend who could spoil the party for either one of them by taking away important points. In Thailand, local hero Sanya Khancai has recently looked the part in UT Nan 100 and certainly cannot be discounted for the 100 miles’ win. Another dangerman for the day’s victory is Alessandro Sherpa. The Italian led the race at BTS Ultra last month until a drop bag issue forced him to retire. Also Japan's Wataru Iino is back in Thailand. He was a joint winner of UTKC 100 early this year before he went to India for work reasons. In Japan, Sefli and Pablo will be up against strong Japanese runners, quite simply because there’s so many of them. While the men’s championship will keep everyone in suspense, the women’s title has already changed hands. Defending champion Tahira Najmunisaa Muhammad Zaid is still unfit to race ultras and has ultimately decided she will not be starting in either race. Tahira prefers to think long-term and needs time to fully recover. The big showdown with Australia’s Kim Matthews is therefore postponed to 2018 and the recent winner of CM50 in Philippines is mathematically assured of the championship win! Ruth Theresia, also injured following CM50, ends the season in third place. Kim Matthews started the season with a win at UTKC 70 in Thailand where she was living at the time. Her pace raised the eyebrows of many, and Matthews showed her speed again in Malaysia during Penang Eco 100k. She led the race until the final 10k. Dehydrated, she fell asleep at the last checkpoint and saw China’s Dong Minfei come back to beat her at the very end. With hindsight, it was the last time Matthews did not win a race. While suffering from the heat at Tam Dao Mountain Trail as well, the Melbourne-born runner just kept on winning races and when she did so at the Vietnam Mountain Marathon and MesaStila Peaks Challenge 65 in Indonesia, she became a serious title challenger for Tahira and Ruth. Two weeks ago in Clark, she had the better of Ruth Theresia and collected the SuperTrail bonus points for winning CM50 and in so doing overtook Tahira in the points ranking. Kim Matthews will be running the 100 miles in Thailand this weekend without pressure. It is, in fact, her first attempt at the distance. While it may not always feel like it during the race, it certainly will also be a race of honour for her. Kim Matthews is the new Asia Trail Master champion! Kim Matthews: the new Asia Trail Master champion!